The annual “Lights of Life” holiday display at Life University takes place every night from Thanksgiving evening through New Year’s Eve. The event features more than a million lights spanning across over a mile of campus. Displays include a nativity scene, a menorah, a 60 foot tall Christmas tree, and numerous stationary and animated holiday displays. In addition, there is a 65 foot tall rendition of Santa and his sleigh that is the tallest display in the Southeast. Nightly from Thanksgiving evening through New Year’s Eve 2018. On the campus of Life University on Barclay Circle, off Hwy 41 just north of Dobins ARB, Marietta. 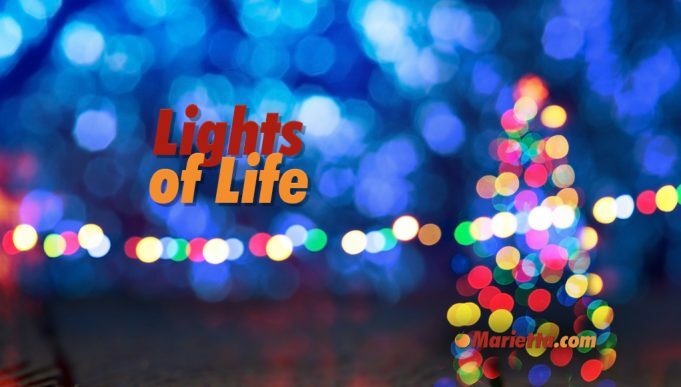 For more information or questions about Lights of Life, please call (678) 331-4334 or visit http://www.life.edu/events/lights-of-life/. Great, wonderful!!! Beautiful lights, we drive all the way from Cartersville just to visit!!! Can you drive your car thru there or do you have to park and go on the train? You can drive your car through there. We do every year. My kids love it. 🙂 we love taking our kids to see the lights!! It’s pretty and fun and we get to take a picture with Santa.. That’s good memories. We been going to see the lights for 15 years now. I invite everyone you will enjoy it with your family!! We have not took our daughter seen she was 1 year old now she 14 and we want to tack her this year . my family loves Christmas year round . No it does not. It takes you up to a parking lot…drives you around and drops you back off in Santa’s village. Still fun though. Are pets allowed to visit and take pictures with Santa? Can you take your Santa pics with your own camera or are they purchase only? Disappointed! Have been coming for years and never seen the nativity stuck off in a corner. The praying hands, Menorah, Noah’s ark, and nativity scene has always been out on the main road, they were all stuck off in a corner!! Where was the hillbilly and his truck? Not worth the wait! Is this for small kids? Are would a car full of adults enjoy this? Do you have to take your car thru or is there a trolly bus that can take you? I have several people wanting to go with us but we don’t have a car big enough! Is this cash only or do they take cards? Worst light show on the planet! It took one minute to drive through after waiting an hour and a half. Do not waste your money and time. Is the $12 for a photo with Santa per person or per photo (can I get a photo of my two kids with Santa for $12 or will it cost $24)? What about the per person charges for the train ride and petting zoo, does that include parents or children under 2? Apparently it’s $12 per person. They can/might refuse group photo’s with Santa. Have they always charged ? I don’t recall this in the past. No. Before it was a voluntary “donation”. My family and I used to go every year when I was a little girl. After my dad passed away we stop going. Now that I have a daughter of my own I’m glad to know the Life of lights still exist. I’m definitely bringing my daughter and niece next year. They sucker you into paying to see Santa and he is never there. . It’s crap! They won’t let you turn around.. We paid 3 times last year them 2never seen santa.. pissed this is my last year!!!! The lights were very nice but $10 to go in a tiny circle I timed it and it was 15.5 seconds and that cost $10 they must be crazy if they think I’m coming back!! You went in the wrong way I think. Somehow we did that the first year they started charging for it. Try again and go in on Barclay entrance. It’s a full 30 minutes if you go all the way thru it. I cannot imagine why these people make comments like that– this takes approx 30 minutes to drive through– longer if you stop for the walk through part- or stop for pictures-which you can do anywhere in it. VERY nice displays and really cheap compared to other ones- which are all ALOT further away. Kids and adults love it. I do not think the complainers have even gone. The lights were ok but not worth the wait. Approx. one hour. What we were able to see couldn’t have been all of them. We could see some from a distance and there were cars there but we couldn’t get to them by car ! Really needed traffic control has I’m sure we missed a turn because we couldn’t see where to turn because of bumper to bumper cars. One of the biggest ripe offs we’ve had in 20 years here in metro Atlanta. Very sad!! This is SO nice!! I honestly don’t understand the negative comments. It’s beautiful, enchanting, fun! I love the Santa’s Village too. I hope they still have the kitties too! Adults & children all love it. I cant speak to the pictures w/ Santa as we’ve never done that. Can’t wait to go again this year! Are the Lights still up on January 1, 2018 anywhere. I don’t get home until tomorrow. Since the Christmas tree Recycling is not until January 6, 2018 are the lights still on at night. Complete ripoff. Don’t pay for a car. To do anything (petting zoo, train) is an additional charge. Just drive through and see the lights and leave. Nothing additional is worth paying for. This used to be a great display and fun to go to. Not anymore . Can I take a uber and walk through?